When I first heard about the now-infamous horsemeat scandal, my first thought was ‘well, no-one thought it was prime meat anyway, right?’ My second thought was ‘what’s wrong with horsemeat?’ As many people before me have pointed out, horse is relatively widely consumed in countries across Europe, Asia and Latin America, and there are no dangers associated with eating properly raised and slaughtered horse rather than, say, cow or pig. I mean, no-one’s become sick as a result, right? And don’t try to tell me that anyone actually noticed the difference in their frozen lasagne. Of course this is just me being flippant. Of course I have a problem with the fact that frozen meals contain not just dodgy cuts of meat but cuts of meat that are from an entirely different animal. While it has been brilliant to behold the hubris of food giants like Nestle, it is also absolutely terrifying. But it’s terrifying not because we’ve unwittingly been eating horse when we thought we were eating beef. Oh no. As stomach churning as you may find that prospect, it’s terrifying because it’s symptomatic of a much wider problem with the way our food is produced – and that is the total and utter lack of transparency in our food system. What the horsemeat scandal has so neatly illustrated, in a way no NGO or campaign has been able to, is just how complex our food system really is. To wit, this video has a great animated map that shows the many twists and turns of just some of the contaminated meat supply took before it ended up in our freezers. The floundering government response to the problem (which even the BBC have reported as ‘flat-footed’) also highlights just how powerful and unaccountable transnational food companies really are. 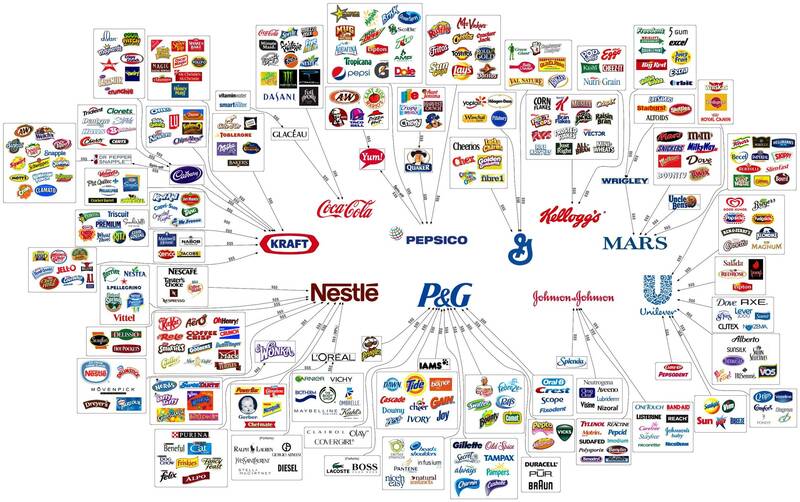 To see the true extent of their reach, check out this infographic, which shows how few companies own so many of the brands we buy every day. These two points – the mind-bending complexity of food supply chains, coupled with that total lack of accountability – are facts about our food system so terrifying that should be keeping far more of us awake at night. If organic growers/farmers have to keep account of everything they do and use why isn’t it the same for all crops/livestock producers? It’s just deplorable how so much money involved (ready meals) can diminish the need for transparency. I worked as a butchers assistant for only 2 weeks years ago and I’ve never eaten lasagne or any type of sausage. It’s only recently I’ve started to buy mince and trad made sausages occasionally – alas, no more! Thanks, I completely agree! Yet another reason I’m trying to eat less meat. You sure have a point! I absolutely agree. I live in Northern France, and every day here brings a new scandal. It is truly scary, but on the other hand, I am not really surprised. These lies have been going on for many years, and there is NO industrial food to be trusted, not even so-called real “beef”, which is in fact meat from old milking cows, and who receive all kinds of medical treatments which should not get into the human system (nor the cow’s either, when one thinks of hormones…). Oh well, it is a sad business.